Ok, it’s simple, but it’s an application that’s not just a “Hello World!” knockoff. 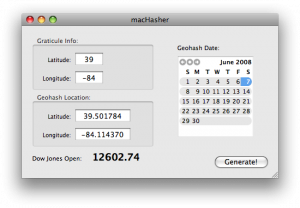 This is a mac implementation of the xkcd website’s geohashing spontaneous adventure generator. It runs on OSX 10.4 and above. It MAY run on pre-Tiger versions of OSX, but I provide no support, and don’t guarantee that it’ll run on those.